Voice Over recording and editing with REAPER just like one would do in Edit Mode of Adobe Audition is not only possible, it’s easy and more powerful. Admittedly, I looked at Reaper several times in the past and it seemed too complicated, and I couldn’t figure out how to make quick time selection edits which are crucial for VO editing. But then I found a hack by that makes it just like editing in Edit mode in Adobe Audition. The video on how to do it is here at The Booth Junkies YouTube Channel. You just set up a Action command key to do four steps at once. It takes one minute to set it up. Okay, maybe two or three with a good cup of tea or coffee. 4.) Set a key shortcut and name for these Custom Actions (I chose “Delete”). I also then set “0” for deleting sections of track Items so I could do that as well. Once you’ve worked out how to do voice over recording and editing with REAPER, you will soon see that it’s incredibly powerful, similar to DAWs like Cubase. There is fully customizable punch and roll capabilities. In Audition, there is only a nice but limited free Add-On to do so. REAPER also has spectral editing, but what I love is the Spectral Peaks capability, so you can really see what the words are in the wavelengths. Here’s an example below. Different peak frequencies appear in different colors. Perfect for unicorn-lovers and chasing away the drab interface of Audition. Note two other things in the screenshot above. You can drop in markers as you record (the red lines), and the grey/gray separation lines are for the ‘items’ that are automatically created when you make an edit. No more confusion as in Audition as to what you actually just cut, especially since REAPER is ‘non-destructive’ editing. I added in the little track icon for the shotgun mic, one of the nice features for labeling tracks. You can apply effects, such as noise reduction, to the whole track or selections. Honestly find the built in dynamic processing in REAPER to be superior in quality and speed to that of Audition. As for VST plug-in use, I noticed that running Izotope RX6 Elements Noise Reduction had better latency and quicker rendering with REAPER. Another nice feature is that you don’t “Save” keeper takes/files. You “Render” them. So, when I’m done with a voice over I select the time parameters with the cursor and Render the time selection to a computer Directory. On Adobe, it just shows you the time it will take to Save. In REAPER it pops up a window with a live-generated waveform and metering levels of the audio. So you can see ahead of time if the exported levels are correct, and if there’s any clipping. Sweet! One of my biggest beefs with Adobe Audition is their gimmicky pre-sets without the power to do substantial things. For example, you can play-back at 2x speed with Audition. That’s helpful for editing long narration, but with even the latest Audition CC 2018 any hard consonants come across as popped plosives. And 2x is a bit too fast for intelligible playback. Even basic Sound Forge lets one play back at custom speeds and the playback is flawless. With REAPER, the playback at higher slider-selected speed it excellent. Just remember to set it back to 1.0 when you Render your files, otherwise it will save it at the fast speed! When I first made this mistake I realized something: REAPER’s time-stretching/compressing power. You can shorten or lengthen audio and it sounds perfect. Just press ALT and move the cursor to the edge of an Item. You can pull it out or in. It will re-set to the new speed to fill in the space. You can make a :30 a :20 and it doesn’t sound artificial like it does in Audition. Whenever I tried to make time changes of more than 8% there would be all kinds of staggered sounds. Not so with REAPER! Here’s a :12 clip followed by it again sped waaaay up to :09. And this edit was done using an mp3, not even a loss-less file! And yes, when you make these changes when working with a video file, it will change the video timing too! You can make simple video edits within REAPER. If you copy, delete, or paste a section of the audio, it will do the same to the video. Pretty cool stuff. If you are working on Windows, in order to work with video in REAPER you will need to download the free VLC Media Player available here. 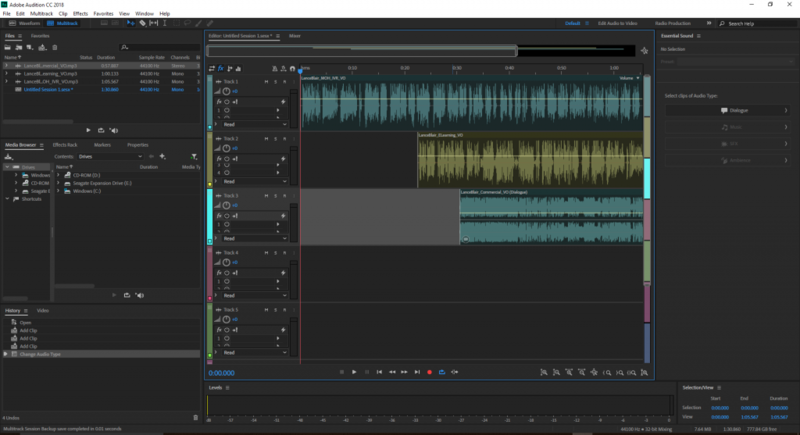 So far so good – after using Audition for much of my voice over career I’ve switched to REAPER and I’m doing more with it than I ever did with Audition. I’ll post more as I learn new tricks and tips. For now, there’s a great amount of YouTube videos on voice over recording and editing with REAPER that are extremely helpful. I encourage you to go check them out as I will be doing when I have the time! Adobe has greatly improved Audition CC 2018 with its new release making it a more flexible and powerful DAW for voice over post-production. What does that mean for you as an audio engineer, a voice over client, or a voice over talent? Auto-ducking of music beds via the Essential Sound panel. Support for the Mackie HUI control surface protocol. Impressive Generate Speech function. I was able to turn a 30 minute script into a high-quality male or female computer voice in 90 seconds. The functionality of this is basic for Windows but comprehensive and very powerful on Mac versions. To make the most out of Adobe Audition CC 2018, you must change a setting they reversed for monitoring inputs. All one needs to do is uncheck the “Enable Smart Monitoring” preference. Otherwise, your monitoring will loopback while recording. Choose “Preferences>Multitrack>When Arming Tracks For Record>Enable Smart Monitoring”. Then to monitor while recording, click the “I” button on the channel strip. Nice of Adobe not to warn anybody about this ahead of time, but now you know! For a full list of the new features, check them out at the Adobe Audition site. Audio Engineer Mike Russell has a helpful YouTube playlist of all his video tutorials about using the new features in practice. I’ve really enjoyed using AA CC 2017 this year as an upgrade to my previous Adobe Audition 3 recording software. My only two complaints have been the obvious ones shared by other users. First, the subscription price is steep compared to other DAWs. Second, automatic upgrades have been deleting user Keyboard Shortcuts. Note that when you upgrade from Audition CC 2017 to the 2018 version check to see if you will have to re-enter those Keyboard Shortcuts. Mine saved perfectly, thankfully. Also, you will need to re-load your VST and VST3 plugins, and then assign shortcuts for those. Perhaps most importantly, make sure that you go to Edit > Preferences > Audio Hardware to make sure it is seeing your settings for your audio interface properly. It will default to MME in most Windows computers, so be sure to select ASIO under “Device Class” drop-down menu in the Audio Hardware page. The Essential Sound Panel will be very helpful for audio editors when mixing sound and narration. My favorite preset in name at least is “That Public Radio Sound” which indeed does not disappoint, just like the rest of this new Audition upgrade. My hope is that most of these presets are not-very subtle, especially the impact of compression, and that most people will adhere to the rule “if you notice the effect of an Effect, dial it back.” But it’s nice to have these tools in the kit with Adobe Audition CC 2018 for Voice Over Production. 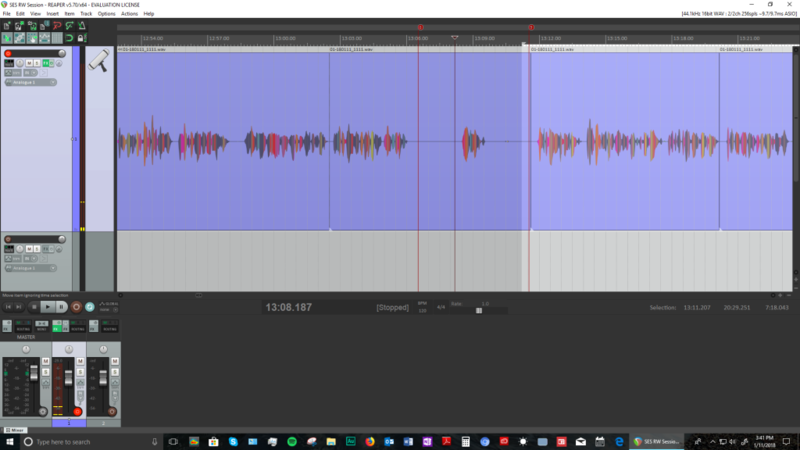 I’m finding that the Vocal Enhancer setting which has male and female settings are pretty much a set it and forget it solution for full sounding voice over auditions, and could be a great tool for editors on a tight schedule. 2016 was a trying, stressful year for many of us. Fortunately, my family didn’t suffer any calamities. Well, a tree feel on my house. Our hot water heater caught on fire. But fortunately nobody was hurt! 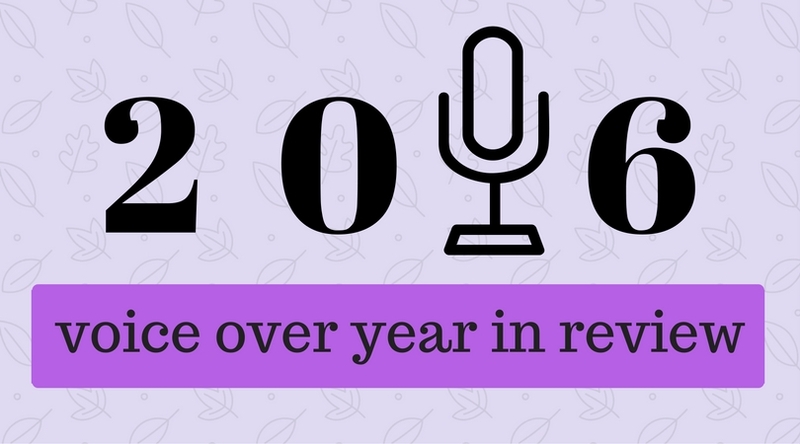 My 2016 voice over year in review was thankfully rewarding and satisfying. I learned a lot. Tried to do things differently. Reach out to new people and new ways of thinking. Stray outside my comfort zone whenever possible. So here we are at the end of 2016, looking forward to a great 2017! Why has the year been so rewarding? Because I made a point of investing in my career. First off, I invested in getting a new professionally produced commercial demo to enhance my brand and marketability. I enlisted the coaching, directional, and audio production talents of Eric Romanowski at Ear Blowing Audio in Virgina Beach, Virginia. As I’m in Atlanta, we collaborated at length over emails and recorded the sessions via my ipDTL account. He really captured my money reads and then pushed some of it into new directions. And the investment has paid off, in ways I could not have expected. For example, I had never done television spots for toys and now I’ve done several for well known brands. On my own, I’ve compiled and edited my new audio and video demo reels for Corporate, E-learning, Explainer Video, and MOH/IVR voice overs from pieces of actual work. Secondly, I invested in the time to learn from others. One of the best things I did this year was attend VO Atlanta in March for the first time. The panel discussions and seminars were outstanding, and it was great to meet so many people that I knew well online but not IRL! Plus, I got to meet new people in person that now I know well online too. I’ll be attending again this coming March. Come see me at the ipDTL booth where I’ll be available to discuss what it’s like to use it as voice over talent. Speaking of ipDTL, I invested in the ‘Tel’ subscription of ipDTL. Not only can I bridge to ISDN on-demand, and stream live to studios; but it’s also a superior replacement for phone patch and Skype. It even works fantastic for connecting to mobile lines if I drop the rate to 64 kbps. So many of my clients love using it to direct sessions live, and it’s really made all those old cranky phone patch or Skype sessions sound so much better and go more smoothly. When it comes to investing in one’s voice over career, there’s always the opportunity to upgrade one’s studio. I upgraded from Adobe Audition 3 to Audition CC. Yes, the monthly subscription is a bit much, but I think of it as an investment. It’s as if it is my monthly rent for my digital office. And it’s the price of doing business in a way that provides the best results for my clients. I also upgraded from a CAD E100s microphone to a Rode NT-1. Same self-noise level but the Rode has a much hotter output and a more flattering tone for my voice. I love it! I’ve owned a TLM-103 and a MKH-416 in the past. The NT-1 sounds very similar to the 103 but with a tighter pattern; it also doesn’t sound tubby and phasey like a 416 can if you’re not working it closely. I also switched from the first generation Scarlett interface to the Second Generation Scarlett which is an improvement in so many ways: preamp, latency, controls, and in the ability to switch seamlessly between programs and sample rates. I’ve got my eye on the new Millennia one-channel preamp for an upgrade in 2017! Finally, what I am most grateful for in 2016 are my repeat clients and my new clients that have become repeat clients in this year. One of the best parts of my job is building relationships with people from all kinds of businesses from all around the world. I look forward to working with all my clients in the new year. How do you get that professional finished sound for voice overs from a home or remote studio? You don’t need to spend a lot of money on gear if you have no weak links in your audio chain. And you don’t need to have the best gear if you use it correctly. A U87 positioned incorrectly is not the best gear. Here are 10 Tips for Great Voice Over Recordings: including audio processing for corporate or E Learning clients that do not have post-production capabilities. Have a great sounding room. Make sure your recording area is quiet, with a noise floor of at least 60 dBFS. The room should have acoustic treatment with DIY or professionally built acoustic panels and bass traps. Some foam and absorbent blankets can help. The idea is to eliminate reverberation and any overstated low frequencies that create a tubby or muddy sound. Also watch out for close sound reflections that can come from a large desk area or a metal script stand. It’s a good idea to cover these with carpet samples. When I record close to a computer screen, I tilt it slightly away from me, so the sound isn’t reflecting straight back. Have a good microphone. While studios may ask specifically for a U87, TLM-103, or MKH 416, you don’t have to own one to get a great sound these days. There are so many manufacturers out there making great microphones. Look for a mic that has a consistent response pattern and low self-noise. Below 14 dB-A is ideal. Consider the pick-up pattern. A tight-patterned cardioid mic is good for recording voice, but if it’s too tight it’s difficult to stay on axis to do voice acting. Have a quality preamp Again, this doesn’t require the best gear. It’s how you use it. I’ve heard plenty of voice overs done with $2000-$3000 preamps that well, didn’t sound all that great. It’s all in how you use it. Whatever you use, if it has an on-board High Pass Filter (HPF) set to 100 Hz or higher, do not use it. There is a lot of sound in the voice between 70 Hz and 100 Hz, and the 100 Hz filter is essentially removing the lower octave resonance of the voice. It will sound thin! Filters set to 80 Hz and below are fine. Many new preamps and mixers are using 100 Hz HPF to ‘limit proximity effect’ but that should be resolved with better mic technique. Many audio interfaces now have good to excellent preamps built into them (Audient, Metric Halo, even the affordable Focusrite gear) so this might not even be an issue. Gain Staging. If you’re using an outboard preamp, set your gain there, and then send it line in to your audio interface. Important: make sure the gain on the interface is as low as possible. When you are running two higher sets of gain it’s a case of ‘too many cooks spoils the broth’. The sound will be veiled and muddy. Another thing to note is that you should set your recording levels to be between -20 dBFS and -12 dbFS on your DAW recording software. “dbFS” means “Decibels Relative to Full Scale” which is the decibel wave amplitude measurement in digital systems. -20 dBFS is the digital equivalent of the good old “0” in VU analogue recording. Don’t record things too hot. Keep it cool, and then turn up the volume heat after you record. For further explanation about recording levels for DAWs, check out this good article from Sound on Sound. In many ways, Gain Staging is arguably the most important of the 10 Tips for Great Voice Over Recordings! Record at 48 kHz /24 bit. Okay, okay…I know 44 kHz / 16 bit is all that is needed for excellent sound for the range of human hearing. However, if you are going to process the audio for post production, the effects will work a bit better with the higher rates. Then, you can down convert however you’d like. EQ I always send raw, unprocessed audio files to professional studios. But when I’m sending to corporate or E Learning clients that do not have dedicated audio engineers, I’ll do some gentle processing on my side. 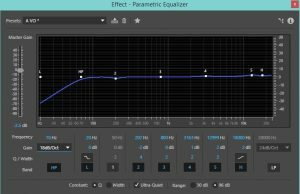 For EQing, I usually run a parametric EQ like the one below in Adobe Audition CC. The HPF is set to 70 Hz. There’s a little notch at 200 Hz to take out some muddiness. A slight bump at 3 kHz for presence, and two more at 12 and 18 kHz for ‘airyness’ or sheen. Note also that I EQ before running a compressor. I want the compressor to reduce the right frequencies. If I run the compressor first, it will react to the overstated frequencies. Expanders – If the noise floor is at -60 dBFS, you don’t need an expander. But if it’s slightly above, I would recommend a gentle expander set to 2:1 at -60 dBFS. I usually set them to have the same attack and release as my compression, which is 8ms and 80ms respectively. Full Signal – If everything has gone right so far, all you need to do is raise the volume to peaks no higher than -3 dDBF. I want to give the end client some headroom when uploading their video or mixing in some music. Always check your video’s audio when it’s uploaded. On many occasions I’ve seen a client upload a voice over video and it was badly encoded on the upload with harsh or distorted sound. Most of the time this happens with YouTube, but also with some dedicated websites. QC your audio when it’s uploaded. If it doesn’t sound right, all it takes sometimes is just to re-upload the video. Good luck, and I hope you found these 10 Tips for Great Voice Over Recordings helpful. Let me know in the comments what other tips and advice you have to share with others. Thanks!